Kisspeptin is an antimetastatic agent in some cancers that has also been associated with lymphoid cell apoptosis, a phenomenon favoring metastases. Our aim was to determine the association of kisspeptin with lymphocyte apoptosis and the presence of metastases in colorectal cancer patients. Blood was drawn from 69 colon cancer patients and 20 healthy volunteers. Tissue specimens from healthy and pathological tissue were immunohistochemically analyzed for kisspeptin and endothelial monocyte activating polypeptide II (EMAP-II) expression. Blood EMAP-II and soluble Fas ligand (sFasL) levels were examined by an enzyme-linked immunosorbent assay method. The kisspeptin and EMAP-II expression and secretion levels in the DLD-1 and HT-29 colon cancer cell lines were examined by quantitative real-time polymerase chain reaction, Western analysis and enzyme-linked immunosorbent assay, whereas lymphocyte viability was assessed by flow cytometry. The effect of kisspeptin on the viability of colon cancer cells was examined by MTT [3-(4),5-dimethylthiazol-2-yl)-2,5-diphenyltetrazolium bromide]. Exogenous, synthetic and naturally produced, kisspeptin induces through the G-protein-coupled receptor 54 (GPR54; also known as the kisspeptin receptor) the EMAP-II expression and secretion in colon cancer cell lines, inducing in vitro lymphocyte apoptosis, as verified by the use of an anti-EMAP-II antibody. These results were reversed with the use of kisspeptin inhibitors and by kisspeptin-silencing experiments. Tumor kisspeptin expression was associated with the tumor EMAP-II expression (p < 0.001). Elevated kisspeptin and EMAP-II expression in colon cancer tissues was associated with lack of metastases (p < 0.001) in colon cancer patients. These data indicate the antimetastatic effect of tumor-elevated kisspeptin in colon cancer patients that may be mediated by the effect of kisspeptin on EMAP-II expression in colon cancer tumors in patients with normal serum EMAP-II levels. These findings provide new insight into the role of kisspeptin in the context of metastases in colon cancer patients. MS and AA contributed equally to this work. Colorectal cancer displays a large percentage of possibility to metastasize to the liver, if left untreated. Possible treatments include surgery, chemotherapy and radiotherapy as well as adjuvant therapy. Colon cancer patients with metastases (stage IV) have a 6% 5-year survival rate (1, 2, 3, 4, 5). The communication and interaction mechanisms between cancer cells and the patient’s organ systems seem to be of critical importance in determining both the pathogenesis and the prognosis of the disease. The tumor’s displayed ability to concurrently evade immunological response and metastasize is attributed not only to disturbances in the longevity of immunocytes, but is also due to the cancer cells releasing mediator molecules that promote immunosuppression (6,7). In systemic circulation, cancer-allocated increased apoptosis of circulating lymphocytes is the most common cancer-associated symptom in patients with malignant neoplasms. Recent evidence suggests that tumor secretion of molecules that are implicated in promoting apoptosis (soluble Fas ligand [sFasL], endothelial monocyte activating polypeptide II [EMAP-II]) in the patients’ blood may result in increased apoptosis of peripheral lymphocytes (8,9). The most common apoptosis-associated molecule, Fas-L, possesses a regulating function in the immunological system and induces apoptosis in the lymphocytes that carry its receptor. Patients with different kinds of malignant neoplasms, colorectal cancer among them, have displayed increased levels of sFasL in systemic circulation (8,10). Recently, a new factor was identified: EMAP-II. This proinflammatory cytokine with antiangiogenic properties has been suggested to be a chemoattractant for monocytes/macrophages and neutrophils and to suppresses tumor growth (11, 12, 13). In addition, tumor-produced EMAP-II can be immunosuppressive by inducing lymphocyte apoptosis. Recent evidence suggests that EMAP-II upregulation is associated with an upregulation of tumor necrosis factor-receptor 1 (TNF-R1) in endothelial cells in vitro. This result may be a possible explanation for the EMAP-II-induced tumor necrosis factor sensitivity (14,15), a factor that exerts pleiotropic effects in immunity, inflammation, cell proliferation, differentiation and apoptosis (16). It has also been suggested that EMAP-II is implicated in the lymphocyte apoptosis mechanism in colorectal cancer patients. However, its exact function in the interaction between cancer cells and immunocytes is still largely undefined (12, 13, 14). It seems that cancer-induced apoptosis of lymphocytes is a particularly important factor of a nonfavorable prognosis: metastasis (17). One more critical factor that is possibly implicated in the metastasis mechanism is kisspeptin protein expression. Kisspeptin is a hydrophobic 145-amino acid polypeptide that is generated by the Kiss1 gene. This precursor is then cleaved to 54 amino acids in length, which can be further truncated to 14-, 13-or 10-amino acid carboxyl terminal fragments. Kisspeptins act as an endogenous ligand to a G protein-coupled receptor, the G-protein-coupled receptor 54 (GPR54; also known as the kisspeptin receptor). Studies have displayed the implication of the kisspeptin protein (metastin) in melanoma and other tumors, suggesting its possession of antimetastatic activity (18). Furthermore, kisspeptin expression has also been associated with apoptosis of GPR54/kisspeptin receptor-expressing lymphocytes, via activation of GPR54, resulting in the extracellular signal-regulated kinase (ERK)-dependent expression of tumor necrosis factor-α and FasL in lymphoid cell lines, the latter being the main trigger of apoptosis (18, 19, 20, 21, 22). 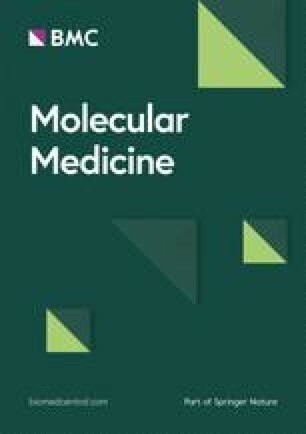 The aim of this study was to determine the direct and/or indirect effect of tumor kisspeptin in peripheral lymphocyte cell death in colon cancer patients (through EMAP-II or sFasL secretion) and to determine if the tumor-expressed kisspeptin possesses an antimetastatic action in the same patients. Blood was collected, 1 wk before and 1 wk after surgery, from 69 colon cancer patients and from 20 individuals with benign condition of the colon who went under surgery. Blood was also collected from 20 age-matched healthy volunteers. A total of 17 of 69 patients presented metastases synchronous with the disease (Table 1). Blood samples were processed immediately after their collection, and they were stored at −80°C for 15 d at the most. Eligibility for the study required histologically confirmed colon cancer or benign condition of the colon, including patients of all stages with a World Health Organization performance status of 0–2 (Table 1). The protocol was approved by the ethics committee of the Hippokrateion General Hospital, and informed consent was signed by all the patients and healthy volunteers participating in the study. The prostate cancer cell line PC-3 and the colon cancer cell lines HT-29 and DLD-1 were obtained by the American Type Culture Collection (ATCC, Bethesda, MD, USA). Cells were maintained in a 5% CO2 incubator at 37°C. The culture medium for the PC-3 cell lines was Dulbecco’s modified Eagle medium (DMEM), for the DLD-1 cells was RPMI, and for the HT-29 cells, McCoys’ 5A, supplemented with 2 mmol/L l-glutamine and 15% fetal bovine serum (all available at Life Technologies, Carlsbad, CA, USA). Peripheral blood mononuclear cells were isolated by using the Ficoll-Paque Plus (STEMCELL Technologies Inc., Vancouver, BC, Canada) according to the manufacturer’s instructions. Briefly, 10 mL phosphate-buffered saline (PBS) + 2% fetal bovine serum was added in 10 mL blood to make a total of 20 mL; this mixture was then gently added on top of 15 mL Ficoll-Paque. Centrifugation followed at 400g for 30 min. Flow cytometry was applied on healthy living lymphocytes by using CD45-CD3 and CD45-CD20 antibody combinations, to ascertain the effectiveness of our lymphocyte isolation method. CD45 binds to all hematopoietic cells with a nucleus, CD20 binds to the surface of B-lymphocytes and CD3 binds to the surface of T-lymphocytes. EMAP-II expression of the cancer cell lines was carried out after protein precipitation (radioimmunoprecipitation assay buffer with the addition of protease and phosphatase inhibitors; Sigma-Aldrich, St. Louis, MO, USA) by Western analysis using an anti-EMAP-II mouse antihuman antibody (Thermo Scientific [Thermo Fisher Scientific Inc., Waltham, MA, USA]), both at a dilution of 1/500. Western blots were assessed by using 60 µg proteins/sample, which were loaded in a 12% sodium dodecyl sulfate acrylamide gel. The secondary antibody was a horseradish peroxidase-conjugated goat anti-mouse antibody at 1:2,000 dilution (Santa Cruz Biotechnology, Santa Cruz, CA, USA). Detection was carried out by using the Supersignal West Pico Chemiluminescent substrate (Thermo Scientific). The expression levels of kisspeptin and EMAP-II was assessed by quantitative real-time polymerase chain reaction (qRT-PCR) as previously described (23). Briefly, RNA extracts were obtained by using the TRIzol reagent (Life Technologies) (23). Each reverse transcription (RT) reaction was carried out by using 1.5 mg RNA mixed with 10 mmol/L dNTP (New England Biolabs, Ipswich, MA, USA) and 3 mg/mL random hexamer primers (Life Technologies). The reaction was then heated at 65°C for 5 min and quick chilled on ice. The RT Mix containing 200 U/µL M-MuLV ProtoScript II Reverse Transcriptase, 5× ProtoScript II RT Reaction buffer, 0.1 mol/L DTT and murine RNAse inhibitor (40 U/µL) (all available at New England Biolabs) was then added, and the reactants were incubated at 42°C for 50 min and 70°C for 20 min. Each reaction was obtained in 25 µL by using 12 µL SYBR green Supermix (Bio-Rad, Hercules, CA, USA), 0.5 µg/mL oligo dTs (Fermantas/Thermo Fisher Scientific Inc.), 2 µL cDNA, and 0.3 µmol/L primers for insulin receptor (IR) and insulinlike growth factor 1 receptor (IGF-1R) (primers: EMAP-II, forward: TGAGG CAGTG ACAGA GCGAT TACTA; reverse: ACCTT GGCTG ACTTG GCTCGC ; kisspeptin: forward, TGCCCACCCT CTGGACATTC; reverse, TACGCAACAT TTCTTTTATTGCCTC; α-actin: forward, CCTCGCCTTTGCCGA; reverse, TGGTG CCTGGGGCG ). The PCR conditions were the same in both cases: 95°C for 30 s × 1 cycle; 94°C for 20 s, 60°C for 30 s and 72°C for 30 s for 35 cycles; and 72°C for 5 min. The products obtained from EMAP-II and kisspeptin primers were verified by sequencing. The effect of kisspeptin and the involvement of the kisspeptin receptor in the EMAP-II expression in HT-29 and DLD-1 colon cancer cell lines were further assessed by blocking the kisspeptin receptor by using a kisspeptin receptor blocking peptide (Kisspeptin 234; Tocris Bioscience, Bristol, UK) according to the manufacturer’s instructions. Briefly, cells were treated with 0.5% serum for 24 h before kisspeptin treatment. Then 500 ng of the inhibitor was introduced into the cell lines and allowed to interact for 30 min. Administration of 1,000 ng kisspeptin followed. Cells were collected 24 h after the kisspeptin administration. Lymphocyte apoptosis was examined by flow cytometric analysis by using fluorescein isothiocyanate (FITC)-labeled annexin and propidium iodide. Peripheral blood mononuclear cells were assessed for early (FITC-labeled annexin) and late (propidium iodide) apoptosis after administration of the conditioned media from DLD-1 and HT-29 cell lines. Apoptosis was measured in lymphocytes 24 and 48 h after human full-length kisspeptin (Abcam, Cambridge, UK) or concentrated PC-3 (wild type and with the kisspeptin gene silenced) media administration. As a positive control of apoptosis, we administered 50 nmol/L docetaxel to the cells. PC-3 prostate cancer cells are known to express and secrete high levels of kisspeptin (22). Before determining the effects of naturally occurring kisspeptin on colon cancer cell lines, we used the media of wild-type PC-3 cells and of PC-3 cells that had their kisspeptin gene silenced. Kisspeptin was silenced in PC-3 cells by using the psiRNA-h7SKneo G1 kit (Sigma-Aldrich) according to the manufacturer’s instructions. Complementary oligonucleotides compatible with the BbsI restriction enzyme before their insertion into the psiRNA-h7SKneo vector were designed by using siRNA Wizard software (https://doi.org/www.sirnawizard.com; InvivoGen, San Diego, CA, USA). Three pairs of oligonucleotides were examined for their ability to silence the kisspeptin production. The pair used was as follows: forward: ACCTCAGAAGGACCTGCCGAACTAC ATCAA GAATG TAGTT CGGCA GGTCC TTCTTT; reverse: CAAAAAAGAA GGACCTGCCGAACTACATTCTTGAT GTAGTTCGGCAG GTCCTTCTG. The siRNA insertion was confirmed by enzyme digest with SpeI and by bidirectional sequencing by using the primers provided in the kit (forward OL559 and reverse OL408). DLD-1 and HT-29 cells were treated with kisspeptin (500 ng/mL) for 24 h. These media were then collected and treated with anti-EMAP-II antibody for 30 min at room temperature and introduced into freshly isolated lymphocytes. Lymphocyte apoptosis was measured 24 h after media introduction. Determination of the human serum Fas-L and EMAP-II was carried out by enzyme-linked immunosorbent assay (ELISA) (Life Technologies and Antigenix America, respectively) according to the manufacturer’s instructions. All samples were measured in duplicate. The immunoassay was carried out in two different samples of the colon in colon cancer patients—one that was collected before surgery and the other that was collected 1 wk after surgery. HT-29 and DLD-1 cells were prepared for standardized MTT [3-(4),5-dimethylthiazol-2-yl)-2,5-diphenyltetrazolium bromide; Applichem, Omaha, NE, USA] assays. Briefly, the cells were plated in 96-well plates at a concentration of 500 cells/well. At 48 h after plating, human kisspeptin full-length protein (Abcam) was introduced to these cells at different concentrations (50),100,250,500 and 1,000 ng/mL). After 24 and 48 h, the MTT was administrated into each well. The absorbance was determined at 570 nm by a microplate reader (Versamax; Molecular Devices LLC, Sunnyvale, CA, USA). Each approach was replicated six times and repeated twice with similar results (24). Immunohistochemistry was carried out in cancerous and noncancerous tissues for full-length kisspeptin with a rabbit anti-human polyclonal antibody at a dilution 1/150 (1.3 µg/mL), as previously described (27); as a positive control, we used human placenta. For EMAP-II, we used a rabbit antihuman polyclonal antibody at a concentration of 1/500 (1 µg/mL) (Santa Cruz Biotechnology); as a positive control, we used colon cancer samples (suggestion of the company). Formaldehyde-fixed prostate samples were paraffin wax-embedded and processed for paraffin sections. Microtome sections of 3 µm were allowed to adhere to glass slides, dried at 37°C overnight, dewaxed in xylene and rehydrated in serial dilutions of ethanol. The sections were then incubated with the primary antibody diluted in PBS overnight at 4°C. Secondary biotinylated goat anti-rabbit IgG antibody (Dako Real EnVision, Dako, Glostrup, Denmark) was then added, and tissue sections were visualized under light microscopy, while negative control staining procedures were also included in all immunohistochemical analyses, as described elsewhere (23). Data are expressed as mean ± 1 standard deviation for continuous variables and as frequency (percentage) for categorical data. The normality of the distributions was assessed with the Kolmogorov-Smirnov test and graphical methods. Comparisons of continuous variables were performed by using the Student t test, Mann-Whitney U test and nonparametric test, as appropriate. Categorical data were compared by the χ2 test, or Fisher exact test, as required. In cases of multiple group nonparametric testing, the Kruskal-Wallis test was used. Comparisons between two related values were performed by using the non-parametric Wilcoxon signed rank test. Pearson correlation coefficient and Spearman rho were calculated to examine linear relationships between variables. Normalization of continuous variables for covariates and subsequent comparisons were performed with analysis of covariance and multivariate analysis of variance. In cases of multiple hypothesis testing, the post hoc Bonferroni-Holmes test was used to assess between-group differences, as well as to control family-wise error to <0.05. All tests were two-sided. Differences were considered as statistically significant if the null hypothesis could be rejected with >95% confidence (p < 0.05). The statistical package used was the IBM SPSS Statistics, version 20 (IBM Corporation, Armonk, NY, USA). Direct kisspeptin effects on lymphocyte cell death. Recent evidence suggests that kisspeptin can induce lymphocyte apoptosis. The signaling of GPR54 (the kisspeptin receptor) is sufficient to trigger ERK-dependent apoptosis via the FasL and sFasL pathway in epithelial and lymphoid cell lines (19,22). Lymphocyte apoptosis is a known factor that is associated with metastases in colon cancer patients (6). On the basis of this finding, we examined the direct effects of exogenous kisspeptin on normal lymphocytes for 24 and 48 h. Fresh lymphocytes were isolated from a healthy donor and characterized by using the markers CD-3, CD-45 and CD-20 (Figure 1A). The lymphocytes, under the effect of different kisspeptin concentrations, were then analyzed by flow cytometry, to detect the levels of apoptosis and necrosis (annexin-propidium iodide staining) at 24 h (Figures 1A–F) and at 48 h (Figures 1G–J). As a positive control, we administer docetaxel to the lymphocytes (Figure 1E). It was determined that kisspeptin did not present any direct apoptotic effect on normal lymphocytes. Exogenous kisspeptin effect on lymphocytes. (A) Characterization of the lymphocytes isolated from human blood with flow cytometry Human lymphocytes were isolated and characterized by using CD45-CD3 and CD45-CD20 antibody combinations, CD45 binds to all hematopoietic cells with a nucleus, CD20 binds to the surface of B-lymphocytes and CD3 binds to the surface of T-lymphocytes. Out of all the hematopoietic enucleated cells isolated, 90% were lymphocytes (76% T-lymphocytes and 14% B-lymphocytes). Lymphocyte apoptosis levels after the exogenous administration of different amounts of kisspeptin were examined at 24 h. (B) Lymphocyte apoptosis without the addition of kisspeptin; 98.6% of the cells are viable. (C) Lymphocyte apoptosis after the administration of 250 ng/mL kisspeptin; 98.05% of the cells are viable. (D) Administration of 500 ng/mL kisspeptin; 98.3% of the cells are viable. (E) As a positive control, we used docetaxel. Administration of 50 nmol/L docetaxel resulted in the increase of lymphocyte death (60.8%) and a decrease in viable cells (39.2%). (F) Summary of the results of the effects of kisspeptin on lymphocytes obtained by flow cytometry at 24 h. Lymphocyte apoptosis levels after the exogenous administration of different amounts of kisspeptin were also examined at 48 h. (G) Lymphocyte apoptosis without the addition of kisspeptin; 77.4% of the cells are viable. (H) Lymphocyte apoptosis after the administration of 250 ng/mL kisspeptin; 92.23% of the cells are viable. (I) Administration of 500 ng/mL kisspeptin; 91.9% of the cells are viable. (I) Summary of the results of the effects of kisspeptin on lymphocytes obtained by flow cytometry at 48 h. It can be seen that kisspeptin does not directly induce lymphocyte apoptosis at 24 or 48 h at concentrations up to 500 ng/mL. Indirect kisspeptin effects on lymphocyte cell death. Whole human kisspeptin was introduced to two colorectal cancer cell lines (DLD-1 and HT-29) for 24 h. Because we used the whole kisspeptin peptide for exogenous administration, the HT-29 and DLD-1 colon cancer cell lines were treated again for 24 h with concentrated media from wild-type PC-3 cells, a prostate cancer cell line, which is known to express and secrete kisspeptin (29) (Figure 2A) and from PC-3 kisspeptin knockdown (KD) cells (Figure 2B). The media from the colon cancer cell lines after the treatment were then collected and examined for the presence of sFasL and EMAP-II (ELISA). A statistical significant increase was observed in the secreted EMAP-II in the media of both colon cancer cell lines (p < 0.001 for both cell lines) (Figure 2C). Although both cell lines secreted significant amounts of EMAP-II, they did not secrete sFasL. Effect of kisspeptin on EMAP-II expression. (A) Characterization of the kisspeptin expression levels in the colon cancer cell lines and in the PC-3 prostate cancer cell line by qRT-PCR; both colon cancer cell lines produce low kisspeptin expression. As expected (22), the PC-3 cells expressed high kisspeptin amounts. (B) PC-3 cells were stably transfected with kisspeptin siRNA, creating a kisspeptin KD PC-3 cell line. The siRNA-mediated kisspeptin inactivation led to a >80% decrease in the kisspeptin levels. Three different stable kisspeptin KD PC-3 clones were generated. (C) EMAP-II detection by ELISA in the media of colon cancer cell lines after the exogenous administration of kisspeptin, PC-3 media or PC-3 Kiss1 KD media. It was determined that both colon cancer cell lines used in this study secrete EMAP-II in their media and EMAP-II secretion increases with the exogenous introduction of kisspeptin (HT-29: secreted EMAP-II = 0.232 ± 0.05 ng/mL, HT-29 treated with 1 µg/mL kisspeptin: secreted EMAP-II = 1.230 ng/mL (p < 0.001), DLD-1: secreted EMAP-II = 0.3 ± 0.03 ng/mL, and DLD-1 treated with kisspeptin (1 µg/mL): secreted EMAP-II = 2.150 ± 0.1 ng/mL [p < 0.001]). It can be observed that EMAP-II secretion from HT-29 and DLD-1 cell lines is induced in the presence of kisspeptin and in the presence of PC-3 media. This result is reversed when the cells were treated with the PC-3 Kiss1 KD media. (D) The 80% confluent HT-29 and DLD-1 cells were starved for 24 h and then treated with 0.5 and 1 ng/mL kisspeptin for 24 h. RNA extraction was followed by DNase treatment and qRT-PCR for EMAP-II. EMAP-II expression was significantly increased in both cases and showed a positive correlation between kisspeptin dosage and EMAP-II expression. HT-29 cells were more sensitive to exogenous kisspeptin administration than DLD-1 cells. EMAP-II expression from untreated HT-29 and DLD-1 cell lines, respectively, was set as the baseline in both cases. (E) EMAP-II detection by Western analysis. The 37-kDa band corresponds to the p43/proEMAP-II, whereas the 24-kDa band corresponds to the mature EMAP-II form. Both kisspeptin treatments showed a marked increase in total EMAP-II expression. EMAP-II expression in both untreated colon cancer cell lines may be associated with the expression of kisspeptin. (E, F) HT-29 cells separately treated with concentrated PC-3 or PC-3 Kiss1 KD media for 24 h. The PC-3 media radically increased EMAP-II expression in HT-29 cells, but the PC-3 KISS KD media showed no effect. (G) HT-29 and DLD-1 cell lines have been treated with 1,000 ng kisspeptin, which lead to an elevation of EMAP-II expression. Treatment of these cell lines with a kisspeptin receptor-blocking peptide reversed the kisspeptin effect on EMAP-II as shown by qRT-PCR. The kisspeptin effects on EMAP-II were also verified by qRT-PCR and Western blot analysis (Figures 2D, E). The effect of the PC-3 media on EMAP-II expression on the Ca colon cell lines was similar to the one obtained after kisspeptin administration. 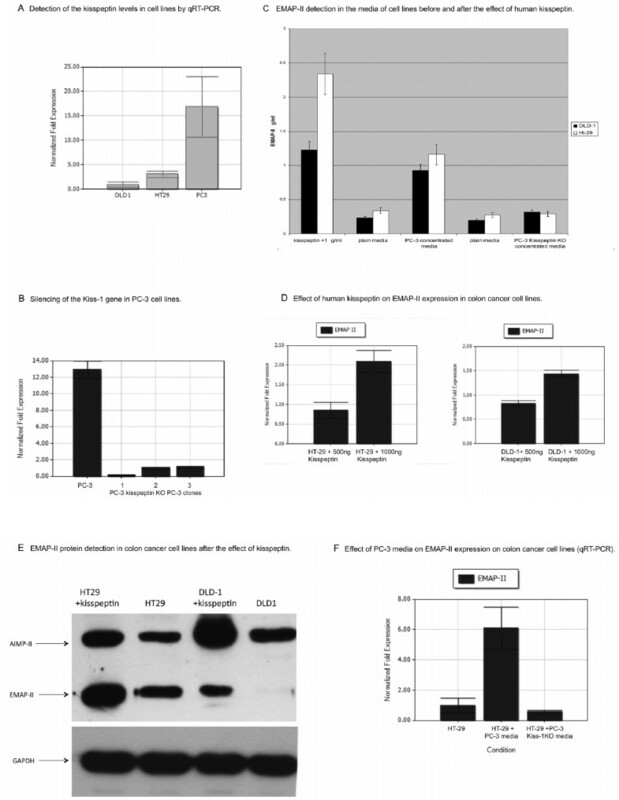 This effect was abolished when the colon cancer cell lines were treated with concentrated media derived from stably transfected siRNA kisspeptin KD PC-3 cells (Figures 4E, F). Furthermore, blocking of the kisspeptin receptor in the colon cancer cell lines reversed the kisspeptin effect on EMAP-II expression in these cell lines (Figure 2G). The effect of the EMAP-II secreted by the colon cancer cell lines after kisspeptin treatment, on lymphocytes, was examined by introducing the media from the HT-29 and DLD-1 cells after kisspeptin treatment for 24 h, into freshly isolated lymphocytes. These lymphocytes presented a statistically significant increase of cell death in 24 and 48 h compared to the lymphocytes treated with media from DLD-1 (p = 0.02) and HT-29 (p = 0.001) cells that were not exposed to kisspeptin (Figures 3A–F). Effect of EMAP-II secreted by colon cancer cell lines on lymphocytes. Lymphocyte apoptotic response 24 h after the introduction of concentrated DLD-1 or HT-29 media and of concentrated media of DLD-1 or HT-29 cells treated with 500 ng/mL kisspeptin. (A) Freshly isolated lymphocytes (86% viable cells). (B) Concentrated media of DLD-1 cells was introduced to lymphocytes; a significant increase in lymphocyte apoptosis was observed (63% viable cells). (C) Kisspeptin has been introduced to DLD-1 cells for 24 h; the media were then collected, concentrated and introduced to lymphocytes. A significant increase in cell death was observed (29.7% viable cells), in comparison to the control and to the lymphocytes that were administered with the untreated DLD-1 media. (D) Untreated lymphocytes. (E) Lymphocytes treated with HT-29 media (89.7 viable cells); a significant increase in cell death was observed (73.8% viable cells). Introduction of kisspeptin in the two colon cancer cell lines and treatment of lymphocytes with the obtained media lead to a statistically significant increase in cell death compared with the lymphocytes treated with the media from colon cancer cell lines that were not subjected to kisspeptin administration. Furthermore, introduction of media from the two colon cancer cell lines after treatment with PC-3 media (PC-3 cells express and secrete kisspeptin) presented a statistically significant decrease of living cells compared with the controls. These results were reversed when media from kisspeptin-treated HT-29 and DLD-1 cell lines was incubated with the anti-EMAP-II antibody and when the lymphocytes were treated with media from HT-29 cells after treatment with PC-3 kisspeptin KD cells media. (F) Kisspeptin was introduced to HT-29 cells for 24 h and the media were then collected, concentrated and introduced to lymphocytes. An even further increase in cell death was observed (61.4% viable cells). (G) To determine the effects of naturally occurring and secreted kisspeptin, we administer concentrated media from PC-3 cells to HT-29 cells. HT-29 media were then introduced into lymphocytes for 24 h. A significant increase in cell death was observed (69.01% viable cells) in comparison to the untreated lymphocytes (89.7% viable cells) and to the lymphocytes introduced with untreated HT-29 media (73.8%). (H) These results were reversed when the lymphocytes were administered with HT-29 media after treating them with the PC-3 kisspeptin KD cells (viable cells 77.4%). (I) Media from kisspeptin (500 ng/mL)-treated HT-29 cells and DLD-1 cells (J) were treated with anti-EMAP-II antibody and were then introduced to human lymphocytes for 24 h (viable cells 77.39% and 89.24%, respectively). (K) Lymphocyte cell death assessment after treatment with HT-29 and DLD-1 media, after introduction of media from both colon cancer cell lines after treatment with kisspeptin (HT29+KISS, DLD1+KISS), after introduction of media from HT-29 cells treated with PC-3 media (HT-29+PC-3), after introduction of media from HT-29 cells treated with media from the PC-3 kisspeptin KD cells (HT-29+PC-3 KO) and after introduction of media from both colon cancer cell lines after treatment with kisspeptin and incubation with anti-EMAP-II antibody for 30 min (HT-29+KISS Ab treat, DLD-1+KISS Ab treat). Concentrated media from both cell lines HT-29 and DLD-1 present a statistical significant increase in cell death compared with the untreated lymphocytes. It has been shown that both cell lines express low levels of kisspeptin and this is associated with the expression and secretion of low levels of EMAP-II. The administration of the media obtained from PC-3-treated, HT-29 and DLD-1 cells to lymphocytes lead to an increase in cell death. This effect was reversed when the HT-29 cells were treated with media from PC-3 cells that had their kisspeptin (Kiss1) gene silenced (Figures 3G, H). Furthermore, when kisspeptin-treated DLD-1 and HT-29 media were incubated with an anti-EMAP-II antibody and was then introduced to lymphocytes, the observed effect of the media from the kisspeptintreated colon cancer cell lines, on lymphocyte viability, was diminished (p < 0.001 for both cell lines) (Figures 3 I, J). All these results are summarized in Figure 3K. From the data obtained up to this point, it seems that kisspeptin induces EMAP-II expression and EMAP-II induces lymphocyte apoptosis. Therefore, the effects of various kisspeptin concentrations in cancer cell viability were examined, on HT-29 and DLD-1 colon cancer cell lines by MTT assays. It was determined that although kisspeptin induces the EMAP-II expression in both cell lines, it is not associated with colon cancer cell apoptosis in these cells. All the tissues that presented elevated kisspeptin presented elevated EMAP-II levels too. Normal colon and metastatic colon cancer tissues express low-to-moderate levels of EMAP-II with no statistically significant difference among them. Elevated kisspeptin levels were significantly associated with elevated EMAP-II levels in the tumors (p < 0.001). In addition, similarly to kisspeptin, EMAP-II expression in the tumor was associated with the absence of metastasis (p < 0.001) (Fig. 4). Immunohistochemistry of serial sections of tumors and of healthy tissue for EMAP-II and for kisspeptin. (A) Immunohistochemistry, for EMAP-II and kisspeptin, of serial sections of the tumor and of noncancerous tissue of a patient representing the vast majority of colon cancer patients that presented distant metastases (16 of 17,94%). Notice that the EMAP-II expression levels of the tumor are similar to those observed in the healthy tissue, and the case Is similar with kisspeptin (low to moderate expression). (B) Immunohistochemistry of serial sections of a tumor and healthy tissue for EMAP-II and kisspeptin from a colon cancer patient who was free of disease and metastases for 8 years, representing the majority of the patients who did not present metastases (44 of 52, 84.5%). Increased kisspeptin levels In the tumor are associated with Increased EMAP-II expression in all the patients examined In this study. Both expression levels are compared with the healthy tissue. In our study, kisspeptin expression is very low in healthy tissues, and It remains low in colon cancer cases who present distant metastases. From the results presented up to this point it seems that kisspeptin leads to EMAP-II elevation and secretion in colon cancer cell lines; therefore, one would expect to be associated with worse prognosis in colon cancer, since EMAP-II is associated with lymphocyte cell death and it is not affecting the viability of colon cancer cells in vitro. Immunohistochemical analysis for kisspeptin suggests that kisspeptin expression was low to moderate in healthy tissues. Increased kisspeptin expression in the colon cancer tissues was observed in tumors of lower grade compared with the normal colon, and it was found to be negatively associated with metastases, stage and grade (tumors of low stage and grade presented higher kisspeptin expression) (p< 0.001 for both cases) and to be positively associated with nonmetastatic disease (p < 0.001) in colon cancer patients (Fig. 5). Absence of kisspeptin expression was evident in 16 of 17 (94%) patients that presented metastases (p < 0.001), indicating that tumor kisspeptin expression is negatively associated with metastatic disease. From the rest of the patients examined (with no metastasis), 44 of 52 (84.5%) expressed moderate to high kisspeptin expression (Figure 5, Table 1). 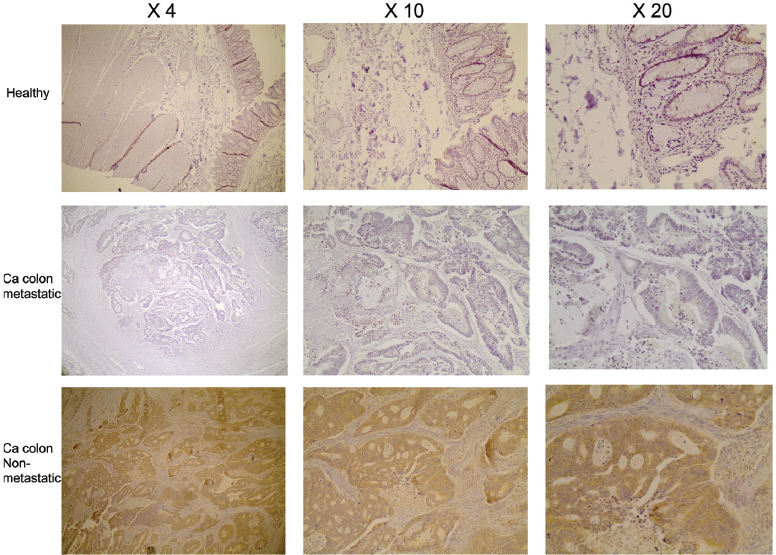 Immunohistochemical detection of kisspeptin expression in colon cancer samples. Images show noncancerous tissue in a malignant tumor of the colon that was associated with distant metastases and in a malignant tumor of the colon that came from a patient has been disease and metastases free for >8 years. Metastatic tumors of the colon, in their majority, presented low kisspeptin expression similar to the healthy tissue. Nonmetastatic tumors presented elevated kisspeptin levels. Human placental tissue was used as a positive control and omission of the primary antibody as a negative control. aThe same patients that presented increased tissue kisspeptin levels presented increased tissue EMAP-II levels. bElevated plasma EMAP-II was observed in a total of 19 patients out of 69, and 16 of these patients were diagnosed with distant metastases. Serum of the patients and healthy controls was examined for the presence of sFasL and EMAP-II, two molecules that have been associated with lymphocyte apoptosis, by using ELISAs. There was not any statistically significant correlation between the sFasL concentration in the serum of colon cancer patients either with the presence of metastases nor with the kisspeptin levels observed in the tissues of colon cancer patients and of individuals with benign conditions of the colon. Colon cancer patients with no metastases presented similar serum EMAP-II levels (before and after surgery) with the healthy individuals. Elevated plasma EMAP-II levels (>0.6 ng/mL) were found to be associated with distant metastases (16 of 19 patients, 84%, p < 0.001) in colon cancer patients. Furthermore, elevated EMAP-II levels in the serum were statistically significantly associated with tumor stage (p < 0.001) (Table 1). In the majority of the cases, serum EMAP-II levels after surgery varied from 0 to 0.375 ng/mL (mean = 0.17), similarly to the levels observed in normal individuals (0 to 0.224 ng/mL, mean = 0.12) and to levels measured in colon cancer patients without metastases (0 to 0.465 ng/mL, mean = 0.21). The host immune system functions as a guardian against tumor development. It has been demonstrated that cytotoxic T-lymphocytes inhibit or delay human colorectal cancer development and metastases. The determination of a possible association of EMAP-II- or sFasL-induced lymphocyte apoptosis in the plasma of the patients suggests association with an increased metastatic rate (14,15,28). Kisspeptin was first discovered to be an antimetastatic factor in cancer tissues. However, since then, data have been varied and at times contradictory. In many cancer tissues, kisspeptin has been positively correlated with increased patient survival, whereas, in others, kisspeptin has been correlated with the exact opposite (18). In contradiction, it has been suggested that kisspeptin induces apoptosis in lymphocytes through the GPR54 or kisspeptin receptor (19), suggesting that increased tumor kisspeptin levels should be associated with an increased metastatic rate. The data presented in this study resulting from the introduction of different kisspeptin concentrations at different time intervals on freshly collected lymphocytes did not present a significant decrease in lymphocyte viability, suggesting that kisspeptin is not directly associated with lymphocyte cell death. It is known that kisspeptin is produced in many tumors, and its presence has been associated with the expression of FasL, a strong apoptotic factor. sFasL is generated by cleaving membrane-bound FasL at a conserved cleavage site by the external matrix metalloproteinase MMP-7, and it has been found to induce lymphocyte apoptosis in colon cancer patients (28, 29, 30, 31). In addition, another tumor-secreted molecule that is associated with lymphocyte apoptosis is the EMAP-II (15). Therefore, to determine if kisspeptin exerts an indirect apoptotic effect on peripheral lymphocytes, we introduced different kisspeptin concentrations for different time intervals into two colon cancer cell lines (HT-29, DLD-1). Both cell lines produce and secrete EMAP-II but not sFasL. The correlation between kisspeptin and EMAP-II levels was also verified by the immunohistochemical analysis of our tumor samples that suggested the proportional concision of kisspeptin and EMAP-II. To determine whether the antimetastatic action of kisspeptin, which seems to be generated through EMAP-II, has to do with the EMAP-II or the kisspeptin effect on the tumor directly, the apoptosis levels and survival of colon cancer cell lines were examined under the influence of kisspeptin and PC-3 media. PC-3 is a prostate cancer cell line known to express and secrete kisspeptin. 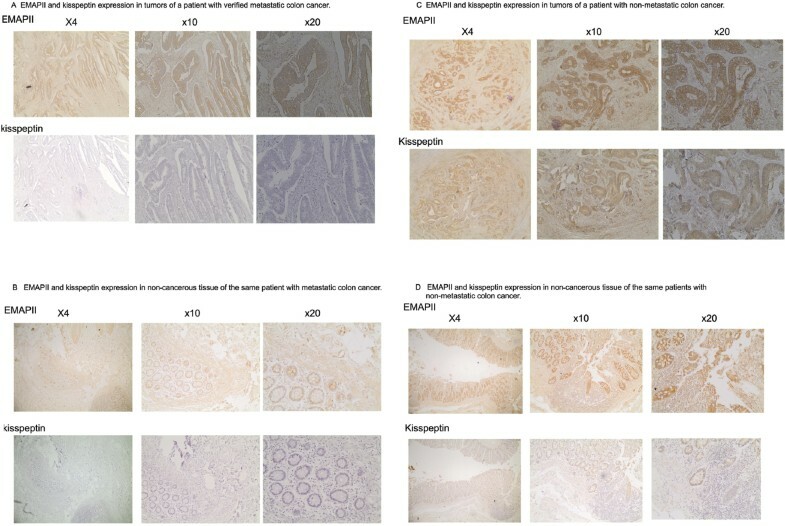 Both factors (kisspeptin and PC-3 media) have been found to generate an increase in the EMAP-II expression and secretion in the colon cancer cell lines that was reversed when the same cells were treated with the media from the kisspeptin KD PC-3 cell lines and with the inhibitor of the kisspeptin receptor. From these series of experiments, it was determined that exogenous kisspeptin leads to an increase of EMAP-II expression in colon cancer cell lines through its receptor and that neither kisspeptin nor EMAP-II present any effects on colon cancer cell apoptosis or cell cycle arrest. These data suggest that kisspeptin does not present a direct effect on colon cancer cell viability or through the expression of EMAP-II. Furthermore, similarly to the kisspeptin, EMAP-II expression in the tumor was negatively associated with distant metastases and with grade. It was also determined that the media from the kisspeptin-treated colon cancer cell lines, which presented elevated EMAP-II secretion, induced lymphocyte apoptosis. This effect was reversed when the media were treated with an anti-EMAP-II monoclonal antibody, suggesting that EMAP-II secretion from colon cancer cells induces lymphocyte apoptosis; therefore, it would be expected that elevated EMAP-II in the serum of colon cancer patients is correlated with the presence of metastases. This result seems contradictory to the kisspeptin antimetastatic effect in colon cancer patients previously observed. In cancer, it has been suggested that EMAP-II clinical value is to inhibit angiogenesis and suppress the growth of primary and secondary tumors with no effect on normal tissues. Recent studies presented evidence that EMAP-II causes a dose-dependent inhibition of proliferation and triggering of apoptosis in lymphocytes; therefore, lymphocytes are targets of the cytotoxic activity of EMAP-II (9,14,15). Examination of the sera of colon cancer patients suggested a direct relationship between elevated EMAP-II and establishment of distant metastases and grade. EMAP-II is found at high levels (>0.6 ng/mL) in colon cancer patients that present metastases. Although this was the case, it was determined that elevated serum EMAP-II was not associated in our study group with elevated tissue EMAP-II and kisspeptin expression in the tumor. sFasL was also examined in the serum of our patients. We did not find any correlation with the sFasL in the serum of patients and tissue kisspeptin, nor with the serum sFasL and metastases. What should be discussed at this point is the fact that EMAP-II levels in the serum did not coincide with the levels presented in the tumors by the immunohistochemical analysis (EMAP-II presence or absence), suggesting the involvement of another mechanism that has to do with EMAP-II secretion in the circulation. The anti-EMAP-II antibody used in this study interacts with both aminoacyl tRNA synthetase complex-interacting multifunctional protein 1 (AIMP1; EMAP-II precursor) and with the mature EMAP-II. High concentrations of arginyl aminoacyl t-RNA synthetase (retinoid acid receptors [RARS]) in tumors impair the secretion of EMAP-II, through the formation of a RARS-AIMP1 complex (AIMP1 is the EMAP- II precursor). Moreover, proteosome inhibition impairs AIMP1 cleavage to produce EMAP-II (32). These data suggest that reduced EMAP-II secretion from tumor cells may be associated to RARS overexpression and/or to reduced activity of the multicatalytic protease (proteosome inhibition), which is involved in the generation of the mature cytokine EMAP-II. Overall, the results of this study suggest that kisspeptin induces the EMAP-II expression in vitro in colon cancer cell lines and colon cancer tissue. Although EMAP-II in the circulation induces lymphocyte apoptosis and is associated with metastases, its secretion is irrelevant to the EMAP-II or kisspeptin levels in the tumor. In addition, kisspeptin seems to inhibit the metastatic ability of the colon cancer, possibly exploiting the antitumor effects of EMAP-II. Further research on this aspect is required before shedding light on the mechanisms that render kisspeptin an antimetastatic factor in colon cancer.